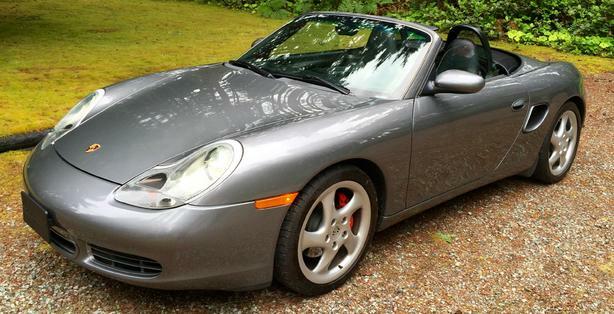  Log In needed $17,900 · 2002 Porshe Boxster S- Super low km’s Great Shape! April 18-New tires, CV Joint replaced, oil, filter, spring maintenance and inspection. Very well kept, no accidents, stored in a heated garage, super low mileage, summer and lady driven only. Electric mirrors, seats, lumbar, CD, 17" wheels, spoiler, This 2002 Porsche Boxster S Convertible in Seal Grey Metallic captures the true essence of a sports car. The 3.2 Liter 6 Cylinder generates show-stopping 250hp when tethered to the 6 Speed Manual transmission. Car is in MILL BAY. This powerful combination delivers near 26mpg on the highway so you can hit the open road and enjoy the cruise. The single latch for the convertible top is a smart and intuitive design. Seating is supportive with a fine textured feel of rich leather, and the level of pedigree is apparent right away. Smart design features are all over the car and compartments for items you need to carry are neatly tucked away. You really need to see this to appreciate the well-cared-for nature of my Boxster S. Safety is emboldened into every Porsche, and the Boxster S is no different. ABS, 4-wheel disc brakes, front driver and passenger airbags, and daytime running lights are just a few of the innovative safety features. Selling only because I bought a new Porsche and don't have the garage space for all.